Liz has enjoyed a varied career in nursing, bringing experience from her work in women’s health, family practice, urgent and primary care. 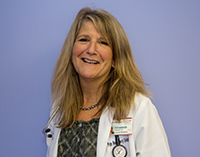 As a nurse practitioner, she has worked at the Washtenaw Health Department and most recently provided primary care at Oakwood Hospital’s Romulus Adolescent Health Center. Liz is a member of the American Academy of Nurse Practitioners. Liz has served on the Board of Directors of the Jewish Community Center and is currently co-president for the UM Men’s Lacrosse Extra Man Club. Liz is married to Todd, a chiropractor in Ypsilanti, has three children and a golden retriever. She is an avid reader and enjoys snowboarding, hiking and biking.